This time of year I long to be back in Colorado, where a bushel of freshly roasted chili peppers is an easy score. There, large metal cages packed full of chilies are turned slowly over open flames outside most markets and at several pop-up stands. As the chilies toast, they hiss, crackle and pop, emitting that familiar piquant, pungent smoke. It's hard not to be nostalgic. Coloradans, like New Mexicans and others from the Southwest, have a thing for green chilies, especially the Hatch chile and Pueblo chile. The two are not a variety but a reference to where they are grown — areas near Hatch, New Mexico, and Pueblo, Colorado, where the dry climate and soaring summer temps make for a tasty chili with a nice kick. At our house, we stocked our freezer with roasted chilies so they could be eaten year-round. Some of my favorite dishes using the prized smoky peppers are chile verde, green chili burgers, bacon and shrimp green chili cheese grits, or the following recipe I've tweaked over the years for rajas con crema, roasted chili strips in a cream sauce. Rajas con crema is a less well-known Mexican dish but one which true Mexican gastronomes know about. It has layers of flavors. It's sweet, smoky and hot from the roasted chilies, rich from the crema Mexicana and a tad hoppy from the beer. (The beer is my untraditional twist.) Rajas make a nice vegetarian side dish and are scrumptious in tacos or aside grilled meat. When I moved to Humboldt County two years ago, I was pleased to find many varieties of fresh hot peppers at the Arcata Farmers' Market. Dean Gilkerson from Earth-N-Hands is my local chili guy. He knows his stuff and has loads of varieties and tips. The chilies for this recipe can also be found at Mexican tiendas and most major supermarkets. Even though I and others refer to the roasted chilies as "green chili," there are many varieties that vary in color and taste, especially as they ripen. They can be a pale yellow-green to deep green to orange and red hues, and a mix thereof. Chilies generally become a little sweeter and hotter if grown in hot weather and if ripened on the plant longer. 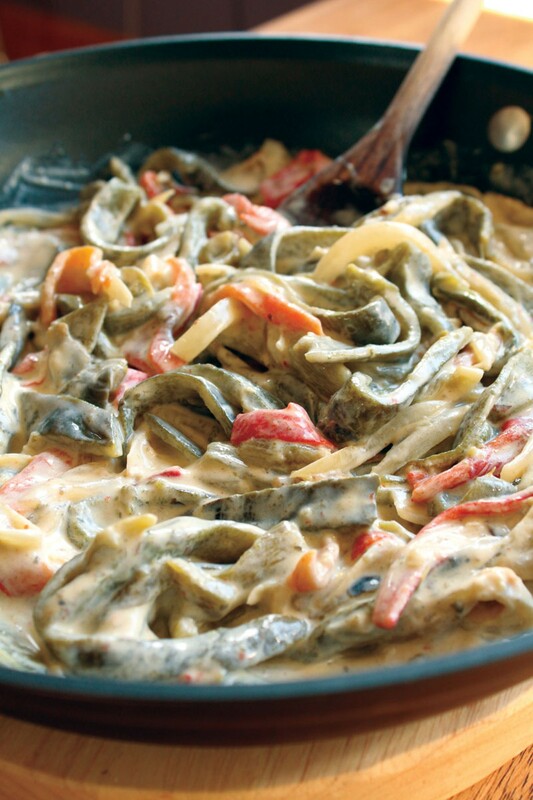 Most traditional recipes for rajas con crema use only poblano peppers. I prefer the nuanced flavors from the different varieties and find Humboldt-grown poblanos too mild by themselves. Ask your chili vendors about the spice level of their peppers. For this recipe I use a combination of fresh raw chilies with varying spice levels: poblano, which are sometimes referred to as pasilla (mild), Anaheim (mild to medium) and big Jim/Hatch chilies (medium to hot). The recipe calls for a mix of peppers — use more or less of the hotter ones to get the spicy bite you like. My papa, who takes his chilies H-O-T, recommends a few mirasol peppers. Crema can be found at Mexican grocery stores or in some general markets near the sour cream. If necessary, you can substitute crème fraiche or heavy cream. Vegetable, chicken or beef stock or white wine can be swapped in for the beer. If you have never roasted chilies, don't fret. It's quite simple and can be done under a broiler or over an open flame on a gas stove top or outside grill. First, roast the chilies. Heat your broiler on high. Place clean dry peppers on a low rimmed baking sheet and broil for about 8 to 12 minutes using tongs to turn every few minutes after each side has blistered and charred about 70 percent (avoid completely blackening them). Watch the chilies carefully and stay close to the stove. 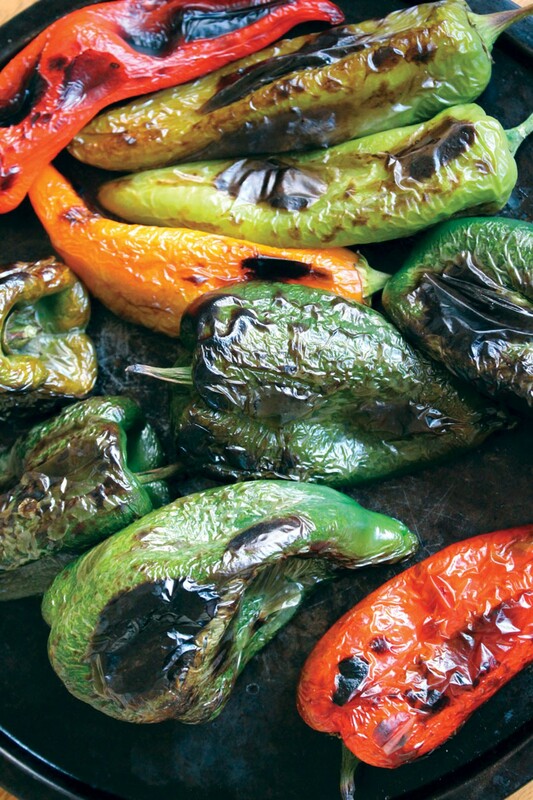 When the peppers are roasted, remove and place them in a gallon size, food-safe plastic bag or in a covered bowl. Let sit for 10 minutes. Peel the skins from all chilies and discard. (If your chilies are spicy, wear rubber gloves to protect your hands and fingers, and be sure to wash them well afterward). Cut each roasted pepper open to remove the stem and core, and scrape away the seeds. Cut the roasted chilies into ¼-inch slices. Slice the onion into ¼-inch half moons. In a large skillet on medium-high heat, heat oil and sauté onion until golden brown and translucent. Add sliced chilies, garlic and salt. Sauté 3 to 5 minutes being careful not to burn the garlic. Add the beer, crema and corn, if desired; stir and reduce heat to a low simmer for 5 minutes. Adjust the seasoning. If your sauce is too thick, thin it with another tablespoon or two of beer (it should coat your spoon like a thin Alfredo or béchamel sauce). Serve hot as a filling for tacos, as a side with beans and rice or with grilled meat. Andrea Juarez has additional recipes on her food anthropology blog www.ForkFingersChopsticks.com. She prefers the Spanish spelling of "chile" and "chiles."